Gensler realized the regional headquarters design for Atos, a global technology company, located in Irving, Texas. As routine work eventually becomes automated by technology, there is a shift of organizational needs for employees with non-routine skills like creativity, interactive problem solving, cross-functional collaboration, leadership, collective learning, and innovation. This is at the core of Gensler’s design program for Atos, a leading global IT service provider who was tasked with managing IT applications for the Olympic Games. 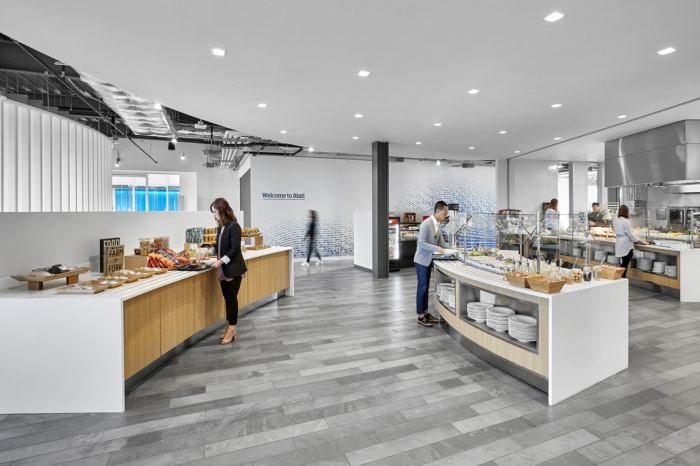 The focus was on creating a purpose-built environment with seamless, cutting edge technology which enables collaboration and cross-fertilization of ideas between teams, connecting their employees and providing an environment that inspires innovation. 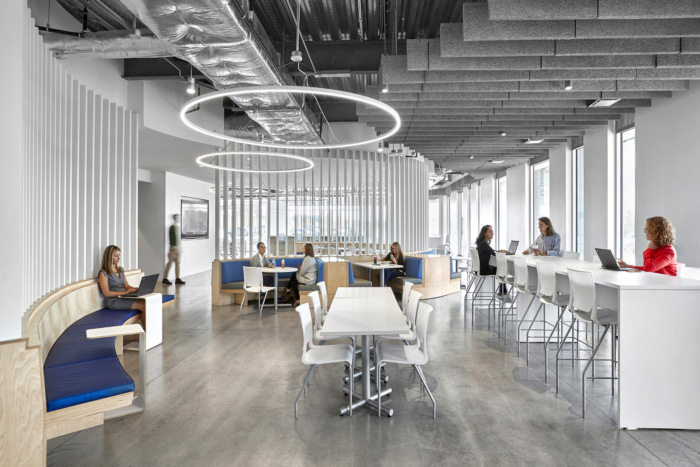 Atos was consolidating five locations in the Dallas area with 219,616 RSF and moving to one location with 100,520 RSF: a reduction in space of 55 percent, and a massive opportunity for reimagining the culture of collaboration through the design and architecture. 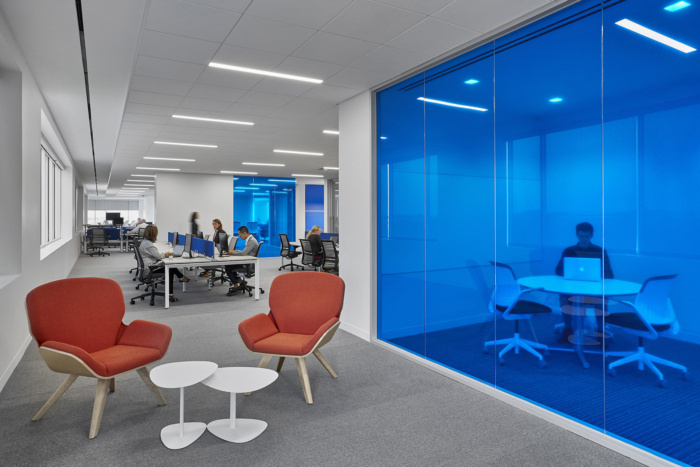 At the heart of the facility is the dedicated Business Technology and Innovation Centre (BTIC) was the first of its kind in North America and will be a blueprint and prototype for other Atos offices. Used for clients to truly experience Atos’ services and solutions for their businesses, a ring of touchscreens stands ready to greet clients. Lighting surrounding the devices can be changed to echo a client’s branding. The screens can be raised, lowered, or tilted for flexible use, and they’re enabled for videoconferencing or as a digital whiteboard. A camera in the back of the room means innovation sessions can be streamed live, or video of a presentation can be archived. The facility is a Smart Built Campus and flexible in nature so employees can move between different areas in the building with no interruption in their work. The building has 100% WiFi and hot desks or touch-down areas for employees to use across the building. Departments are assigned a neighborhood which makes it easy for colleagues to find each other. A key element of the new design is a repetition of small open spaces for impromptu meetings and knowledge sharing. 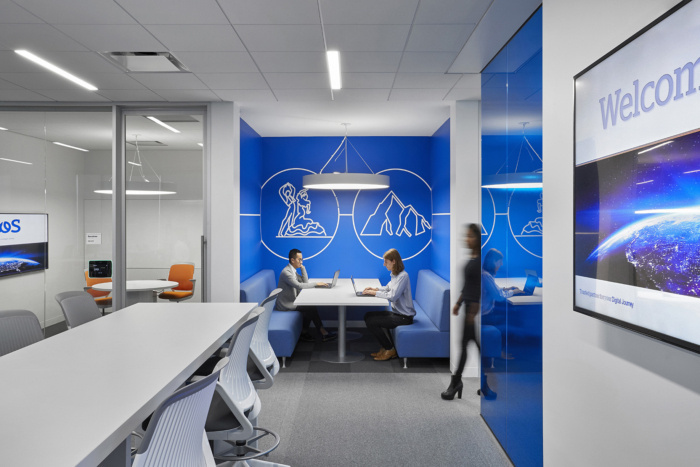 Employees have access to WePresent on various monitors across the site to project their laptop wirelessly; Evoko meeting scheduling for room booking; a Microsoft Surface Hub and writable surfaces within the meeting rooms. Atos was one of the first organizations to be utilizing the Microsoft Surface Hub, which enables engaging and productive meetings with its large multi-touch display, responsive pen and inking experience, built-in video conferencing and on-board Office apps. Time is thus spent connecting to people rather than technology, furthering their goal of inspiring innovation across North America.